Where once Apple reigned, Samsung now sits supreme. The Korean company surpassed Apple in 2012 to grasp the largest portion of the "smart connected device" market that any single company held, according to marketing research firm IDC. That market includes desktop and portable PCs, tablets, and smartphones. In a report published on Thursday, the firm found that Samsung gained 20.8 percent of sales from those devices in 2012 - up from 12.3 percent the year before. Apple, by contrast, went from 16.3 percent in 2011 to 18.2 percent in 2012. Though Apple and Samsung's shares of the "connected device" market both went up in 2012, Samsung's rose considerably more nabbing the top spot, according to IDC. Lenovo came in third with 6.5 percent of the market, and HP and Dell followed with 4.8 percent and 3.2 percent respectively. Finally, the other 46.4 percent of the market went to a mish-mash of other brands, which IDC lumped together into one category known as "other." 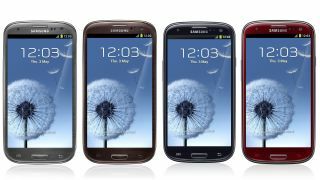 Samsung's unit shipments totaled 250 million in 2012, compared to 114 million in 2011. On Apple's side those numbers read 218.7 million and 151.5 million for 2012 and 2011, respectively. iPhone, where are you now? IDC's report came just days after another that claimed Apple gobbled up 19.9 percent of total consumer tech revenue in 2012, a figure slightly higher than IDC's estimate. Apple launched the iPhone 5 last year, but according to IDC's numbers that couldn't save it from the dominance of Samsung's flagship Galaxy S3, released earlier in 2012. That's despite record sales from Apple, even, whose devices are beginning to look less and less appealing in the face of strong competition. All except the iPad and iPad mini, that is, which topped tablet sales in 2012, IDC reported. It's just too bad that Apple and Samsung's overblown court battles can't be settled based on sales numbers. IDC also reported that the total market for PCs, smartphones and tablets rose 29 percent in the last year.